Charting progress in the modern classroom can be a major dilemma for teachers—especially when the only assessment tools and strategies available are for a traditional setting with a traditional report card and grading system. There has to be a fair and valid way to assess and report progress! 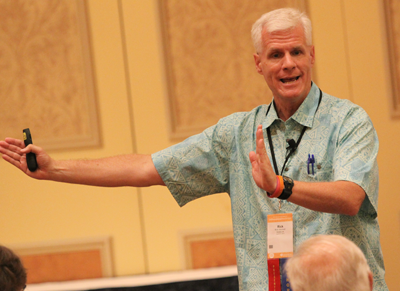 During this two-day workshop, Rick Wormeli shows you how you can manage evidence-based assessment and grading, using innovative strategies designed to meet your state’s standards as well as your students’ unique needs. Join us to discover how to dramatically impact teaching and learning in your classroom! Learn the “how’s” and “why’s” of assessing and grading diverse learners in all subjects in a standards-based world! Focus assessments so that they provide valid evidence of what is and is not mastery. Effectively use assessment that reveals your students’ readiness and then provides descriptive feedback to help students revise their efforts and achieve mastery of content and skills. Identify the necessary elements for useful pre-, formative, common, and summative assessments that really work in today’s classrooms. Know what to grade, how to grade, and how to report a grade, especially when working with students who learn differently. Thoughtfully address the burning issues of assessment and grading, including designing rubrics, using grading scales, averaging scores, handling zeroes, homework, do-overs, late work, extra credit, and much more. Develop a principled mindset to determine assessment and grading techniques that create transcripts of true integrity that stakeholders in other schools and districts can trust. Download the conference brochure PDF for offline viewing and agenda review.